Q. How Can I Check My RS-232 Port to Verify Operation? Loopback connections can be useful when testing serial ports and to determine if the serial port is working as expected. Perform a loopback test using a terminal program that allows you to open a serial port to send and receive characters. To check both inputs and outputs, the outputs are connected to the port inputs. 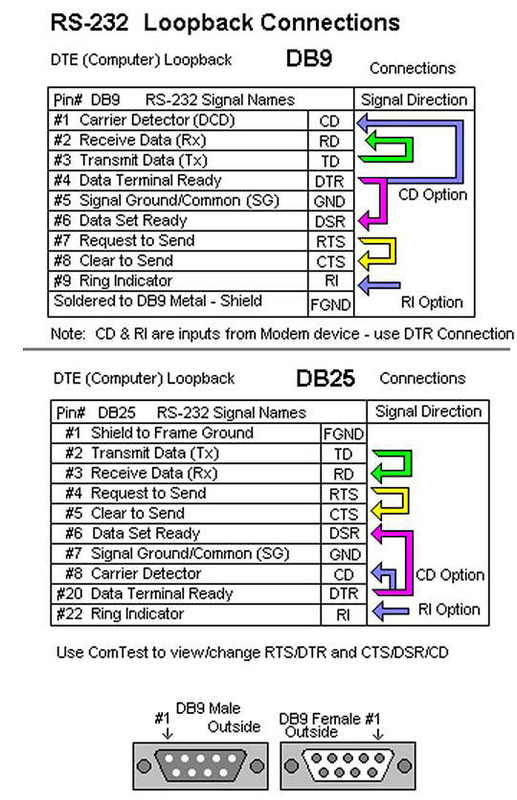 The below diagrams show pinouts and connections for serial RS-232 loopback DB9 and DB25 connections. All connections shown may not be necessary for all applications. NOTE: Pin numbers are molded into the connector. To locate pin #1 on the male connector, hold the connector horizontally with the row with the most pins on top: the upper left-most pin is #1. On a female connector, the upper right-most is #1.